The elongated, cylindrical pods measure 6 to 8 inches long and an inch wide. Delicious either fresh or dried, at the immature stage the beautiful fruits are a remarkable, glossy, deep forest-green color that matures to dark chocolate brown. Plant outside after last frost or April 15th. Space 1 ½ to 1’ apart. Dig hole 2-3 times larger than root ball. Mix in ¼ to 1/3 compost, backfill, press lightly and water deeply. After a few weeks, before blossoms appear, give the plant ¼ to ½ cup organic vegetable fertilizer. Water deeply and thoroughly and do not allow to dry completely. 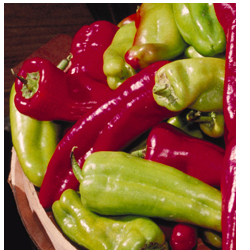 Too little water will cause “dog - tail” or curled misshapen peppers.